Handcart Gulch, named for the handcarts that Colorado miners used to pull outfits up the steep valley, was a rowdy area that reached its peak in 1876-77 with several hundred miners in the area. Today, only some ruins mark the site. 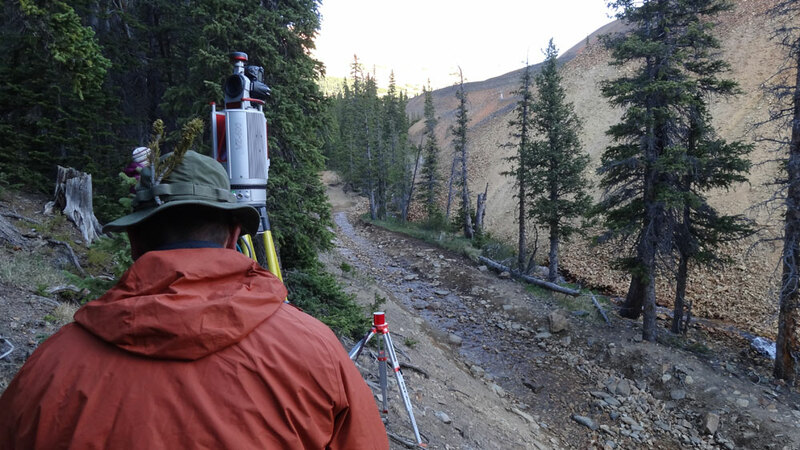 It is also the site of a terrestrial laser scanning project that aims to shed light on some unusual geological features in the gulch. 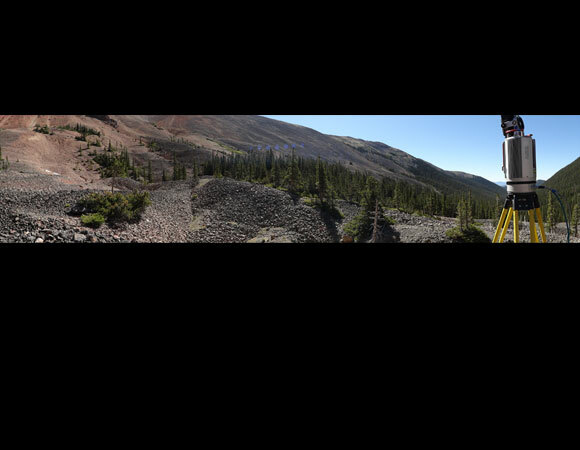 Jonathan Caine of the U.S. Geological Survey is interested in mapping and understanding the origin of curviplanar normal fault-like structures that dissect the surface of the Handcart rock glacier. Rock glaciers are among the most spectacular and most widespread periglacial phenomenon on earth. As glaciers shrink, they become increasingly covered with debris. Eventually, the glacial ice is replaced by debris that can have complex ice-cores and(or) interstitial ice. Once established, the rock glacier continues to behave like a glacier in that it continues to move very slowly downhill driven by gravity. This motion commonly causes surface deformation (strain) expressed as geomorphological features such as arcuate ridges. 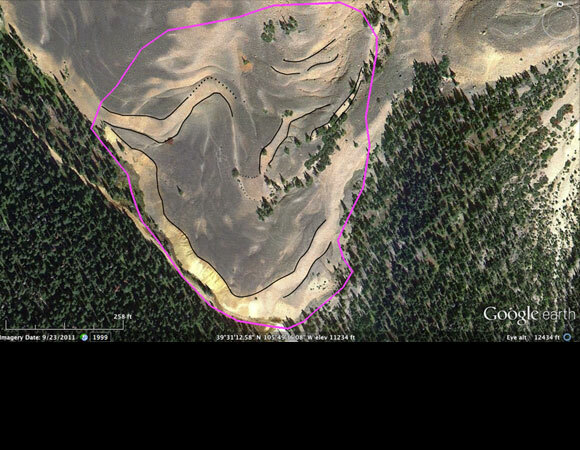 In Handcart Gulch, it is currently unclear if the strain marked by potential curvipalnar faults is being caused by normal gravitational motion of the rock glacier or perhaps by internal collapse due to melting of an ice core and/or interstitial ice driven by climate change. In order to explore the possibilities, it was necessary to map the rock glacier surface in detail and use the map data make a number small-scale geometric calculations, only made possible by terrestrial laser scanning. 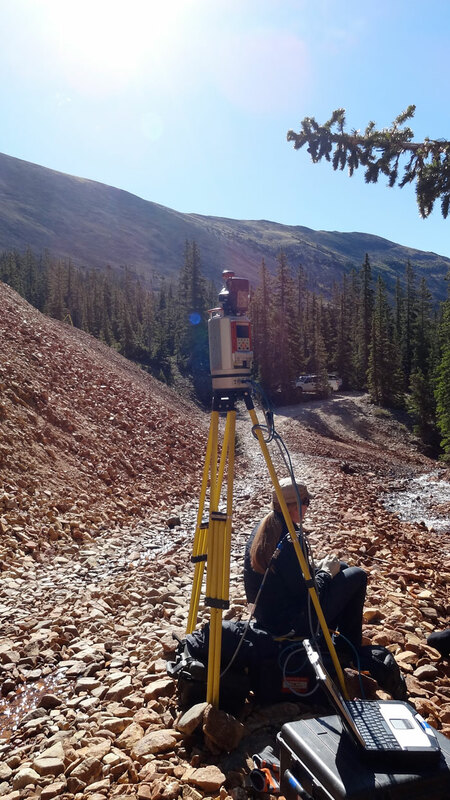 In June of 2012, UNAVCO engineers Abe Morrison, Sarah Doelger, Emily Seider and RESESS interns Yanet Cuddus and Melissa Carnicle conducted a TLS survey of the rock glacier at Handcart Gulch with a Riegl VZ-400. 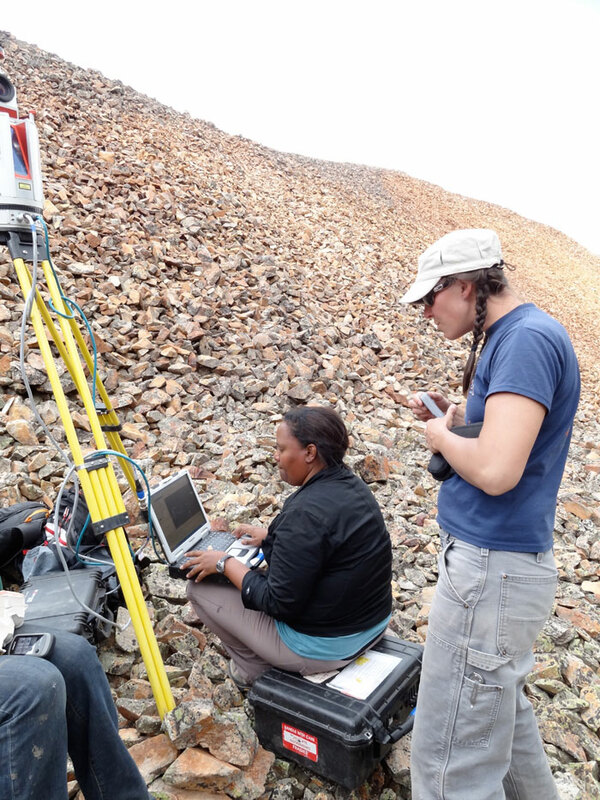 Although travel to the study area and deployment of instruments to complete the scanning over the glacier was very difficult due to the remote and very rugged location, the TLS approach was far superior than traditional methods. 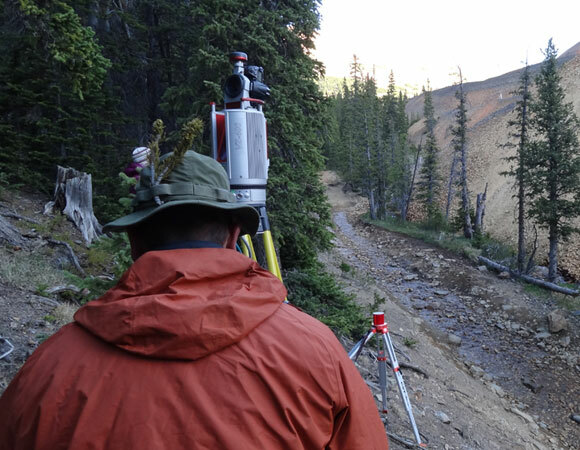 With its almost 500 meter range, the instrument was the perfect tool for this location and required fine-scale, topographic data acquisition at the centimeter scale. Three Topcon GB-100 GPS campaign systems were also used to georeference the data. The approach will also allow for future TLS repeat scanning to be used to map the motion and associated strain of the evolving rock glacier. Figure 1. 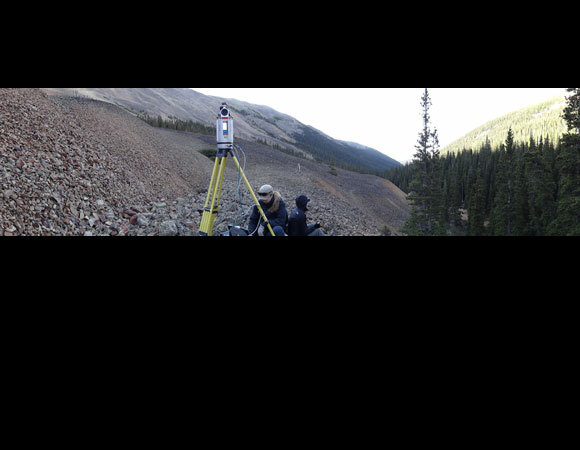 TLS scanner in the foreground looking out onto the rock glacier. Photo by Abe Morrison. Figure 2. 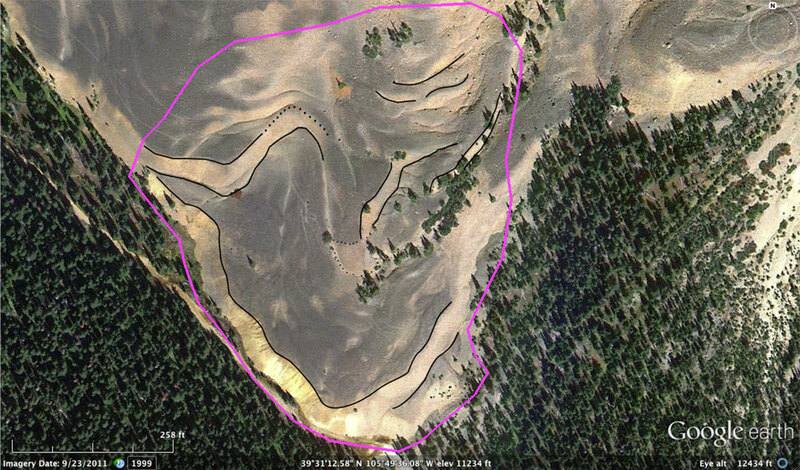 Google Earth map of the Handcart Gulch rock glacier TLS survey footprint (pink line) and potential faults (black lines) [U.S. Geological Survey and RESESS]. Figure 3. UNAVCO Engineer Abe Morrison scanning through the trees. Photo by Sarah Doelger. Figure 4. 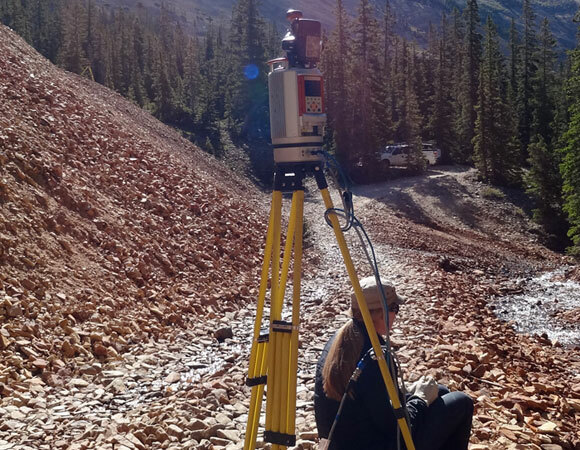 UNAVCO Engineer Sarah Doelger scanning the front edge of the rock glacier. Photo by Abe Morrison. Figure 5. UNAVCO Engineer Sarah Doelger and RESESS intern Melissa Carnicle operate the scanner. Photo by Abe Morrison. Figure 6. 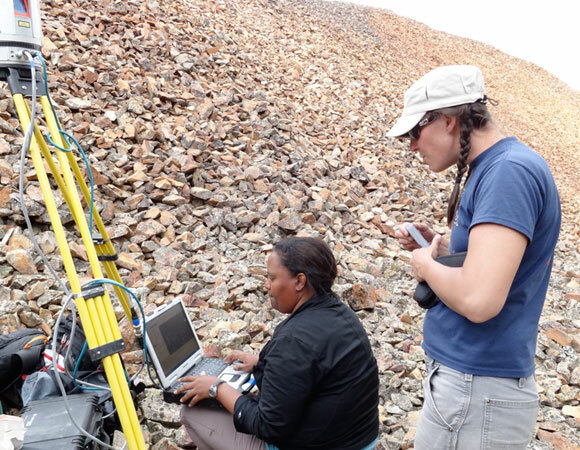 UNAVCO Engineer Emily Seider and RESESS intern Yanet Cuddus scan on the front face of the rock glacier. Photo by Abe Morrison. The TLS work in this region will create a detailed map and characterization that will shed light on its geomorphology and provide insight into temperate-latitude rock glaciers and types and causes of deformation leading to unique surface geomorphological features of rock glaciers, whether by normal mass movement, changes in precipitation related to climate change, or other factors. TLS mapping may also yield new methods of using the latest technology to advance mapping of irregular and rough surfaces at appropriate scales.